True Crime is a sub-genre that holds a distinct fascination for audiences. From the life-saving power of Errol Morris’ The Thin Blue Line through the gaudy glamour of The People Vs OJ Simpson to the plot-thickening tension of Making A Murderer, docs and dramas alike have captivated viewers with the whos, whats and wheres of real-life wrongdoers. However, telling such a tale becomes a lot tougher when the crime is especially heinous… and the perpetrators themselves are children. 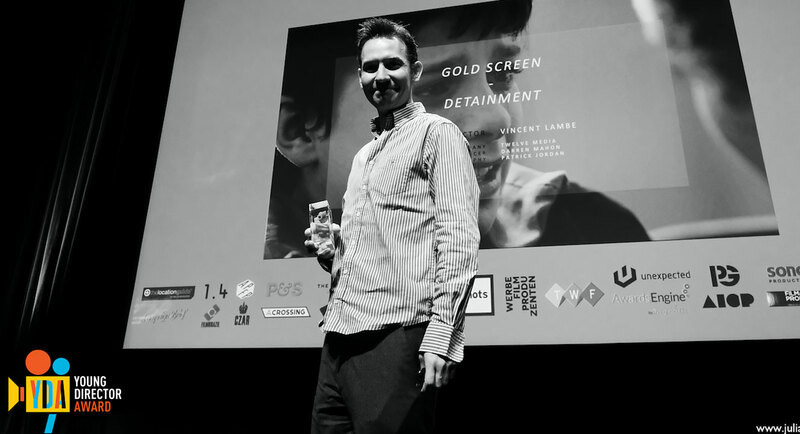 Above: Vincent Lambe picking up one of his two YDA trophies in Cannes last month. In his award-winning short Detainment [three scenes from which can be viewed above], director Vincent Lambe tackles the heartbreaking Jamie Bulger case - in which two pre-teen boys tortured and killed a 2-year-old boy - by dramatising the devastating police interviews given at the time. Injecting emotion, power and unexpected pathos into the piece are two exceptional performances by the young leads taking on the roles of Jon and Robert. Coupled with authentic reconstructions and tight editing, the short’s 30-minute run-time packs a punch that has already provoked standing ovations and awards from screenings worldwide - including this year's YDA. "I thought of those two boys who terrified us with their malice all those years ago. I couldn’t understand how two ten year-old boys could commit such a horrific crime." The film states that it’s based on the transcripts of the actual police interviews - did you take that verbatim or was there a need to heavily adapt? By the end, I felt I saw something that not everyone was seeing, but I obviously had apprehensions about making the film as it is such a sensitive story. The public outrage surrounding the case of James Bulger was unprecedented. It has provoked universal grief and anger, which, even after 25 years, is still very much evident. So, it was very important to me that details were accurate and that the film was entirely factual. Above: Ely Solan who brillianly and painfully portrays Jon Venables. I have worked in casting for a long time, and as an agent for child actors. Over the course of 12 years, I have done thousands of auditions with children and I’ve learned a lot about the most effective ways to direct child actors. Often, a kid with no acting experience whatsoever is the easiest to direct and that’s what we found with Ely Solan who plays Jon – he had never acted before and this was his first audition, but he is an extraordinary boy who is very in touch with his emotions. I don’t think he knew what he was capable of, but by the end of his first audition, something inside him had been unlocked. "I told the actor who was reading the lines against them to just completely lose his rag with the boys during the improvisation. It always took them by surprise and suddenly, they weren’t acting anymore." We did a big casting and saw hundreds of boys for the lead roles. We would get them all to prepare a scene in advance, but then we started improvising with them on the day and took the scene to a different place. In the film, the detectives are quite gentle in their questioning, but for the purpose of the casting, I told the actor who was reading the lines against them to just completely lose his rag with the boys during the improvisation. It always took them by surprise and suddenly, they weren’t acting anymore. Once the boys had been cast, we spent the summer months rehearsing and we all got to know each other really well. So, by the time we started shooting, they were well prepared and very comfortable with the roles. It was, of course, a very warm, friendly set for the kids to work on and they really enjoyed the experience. But there’s a lot of very challenging emotional scenes throughout the film and I think one of the biggest challenges as a director was for all of those moments to ring true – they needed to be done with an intimacy and a naturalness which makes the audience never feel as if they are being played. Above: Lambe on set with his actors. The film is a tough watch. Was there any point at which you considered sharing fewer details? There’re a lot of details that we chose not to include. We thought about it a lot because it is such a sensitive story, but we felt it was important to keep the essential facts. The film gives a very brief glimpse of what happened during the interviews, but there is a lot more to the story. Did you involve/consult any of the families in the making of the film? "It’s impossible to show the unimaginable pain of James Bulger’s family in the space of a short film and I think it would have been entirely inappropriate to try to do justice to that in such a short space of time." It’s a story that most people in the UK know, but may not be in the minds of those outside the United Kingdom; have you found audiences reacting to it in different ways? "Since I was about 10 years old, I’ve dreamed about having a career directing so it’s an exciting time for me right now."